This story appeared in the print and online edition of the Sunday Business Post on the 9th of June 2013. Another banking win is how some heralded the move by the NTMA to drop their savings rates, in some instances these rates reducing by over 40%. The savings products are distributed on an agency basis by An Post, but was it a decision made due to bank pressure and is there anything a saver can do about it? To start we need to remember that typical deposit rates in normal nations with healthy banks are generally about one percent or less. Our nation is not typical, our banks are still far from healthy, so we have seen elevated rates for the last five years. At one point in late 2008 early 2009 you could get over 5% on a one year deposit. And although the banks whine about An Post having state backing and great rates they didn’t do this when their members had the best rates during the financial crisis and only existed due to state support, sauce for the goose simply is not sauce for the gander in the world of banking. What is most surprising is that for all the rage about bondholders very few realised that there was an explicit transfer from taxpayer to savers at this time – also at a time when Deposit Interest Retention Tax was about 40% lower than it is today (20%). In early 2009 the ECB base rate was 2.5% but the outlook back then was for a rapid reduction in rates and this meant that the expected margin on deposits was far higher than now. Oddly, at the same time the Euro interest rate yield curve was steeper but that was a symptom of banking stress, banks were starved for deposits and had to pay over the odds for them while at the same time undercharging on all new lending – something still not fully resolved – and dealing with large back books of lending where margins were often pre-set with products such as tracker mortgages. Since the start of the year Banks made it clear for some time even in this paper that they were unhappy with the competitive advantage An Post products offered, but there was little furore when the NTMA reduced their rates last December from between 0.35% and 0.95%. The NTMA are lobbied by many groups apart from banks, but in this recent instance their move is seen as a success for banks who became more public with their upset at the market leading position An Post was able to hold. The Irish Bankers Federation were quick to state that they were pleased to see a ‘competitive and level playing field on deposit rates between various institutions’. In short, the NTMA do not believe that they need to pay over the odds on any of their offerings. Although it is not a topic of conversation outside of banking circles the other undercurrent is that one year deposits will move below 2% this year and head toward 1% in 2014 assuming there are no systemic shocks. The remaining issue is market share, in 2011 State Savings held about 10% of the market, up from about 6% pre-crisis, today with just over €17bn held it represents just below 19% of the savings market and the banks want those clients back. Currently the best deposit rate for a 12 month term (the benchmark financial advisors watch the most) is 2.55%, down significantly from this time a year ago and as mentioned, due to go lower again. The other big funding gain is ‘zero rated funds’, regular banking used to be free and it was a funding source, now with so many charges coming in it is both a funding source and an income generator, something the banks have gained an edge on but that they are slow to broadcast. An advantage with NTMA savings is the tax treatment, often there is none, but many savers don’t consider the tax equivalent yield. You get this by dividing the number one by the after tax return elsewhere. DIRT is 33% so you need to divide any NTMA rate by 0.67 to figure out what you would have to get on a normal deposit account to match it. This would imply almost 2% on three year savings bonds, or 4.4% on a ten year national solidarity bond. Taxation did and always will matter, with DIRT likely to be raised more (it’s up 65% since 2008) these products remain important, although even with advantageous taxation they are no longer market leaders. Perhaps the real question is why savers don’t try to ‘beat the bank’, somehow in the world of upside down pricing the Irish state is paying almost as much for money as the State Savings or the banks! Our 2023 sovereign bond pays 3.81% but you pay income tax on that, it still doesn’t solve the problem, investment grade corporates (anything -BBB or above) pay in the region of 5% or more and you have high expectations of getting your par value (issue price, normally 100) back. This may be a better strategy but it’s costly (typically corporates are bought in lots of €50,000 and you have concentration risk). Some investor are also going further down the ladder into high yield but these markets can turn nasty fast, and in general with many commentators saying there is a ‘bond bubble’ it may be best to stay out of these markets but it doesn’t solve how you beat the banks relentless march down from peak deposit rates. You could opt for dividend paying stocks, one might argue that some strong corporates are more trustworthy than our financial institutions, but that carries a higher risk, something most of those saving are seeking to avoid. Tax deferment schemes like pensions are a way to increasing your return but access is restricted so the sad reality is that savers have fewer places to turn for returns unless they want to invest and take on risk. The question is what type of risk is the most appropriate. There is inflation risk, unending monetary easing will have eventual consequences, but when? And how much? Irish savers are still getting over mass wealth destruction that they either experienced or saw others go through and this bides well for deposits in general which are boosted by customer inertia. 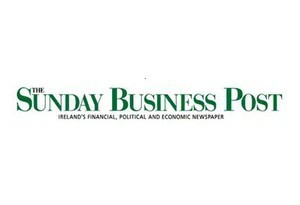 The group that should be most concerned are the least likely to change, and that’s the Irish consumer, it may be that until inflation returns and real values are being eroded that nobody will do anything, something that would greatly please banks who will become the beneficiaries of that inaction.